A Walk-in Shower is a section of bathroom that is fitted with a low or level access shower tray. In addition they are completed with a shower screen or enclosure. Nightingale Bathrooms® offer a wide range of specialist, anti-slip trays. They come in many different widths and lengths to suit all types of bathroom. 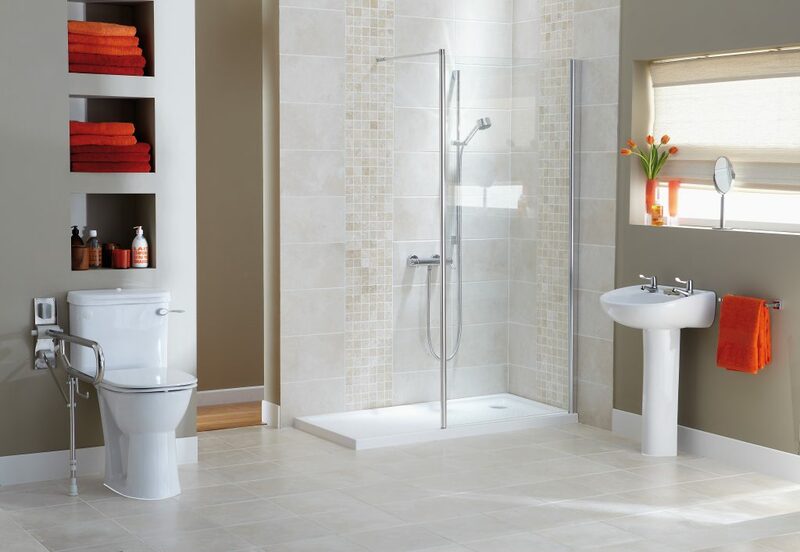 So no matter how awkward or small your bathroom is we will usually be able to provide a shower tray to suit. Our Walk-in Showers come with a choice of clear or frosted glass and also with a choice of a white, anodised or chrome finished frame to suit all bathroom decors. Our most popular option currently is a fixed screen (500-1000mm wide) with a 300mm rotating panel which can be positioned to shield from water splash. A Walk-in Shower enclosure with low entry or level access tray adds a minimalistic contemporary design to your bathroom. As a result this maximises use of space. Designs can be sleek while giving easy access. In addition, providing a practical solution that is simply stunning. Most importantly, all our trays are anti-slip but for additional comfort and safety wall fixed shower seats and grab bars can be installed to a height and location to suit the customer. Customers can choose from a wide range of options. For instance, the tray shown in our picture is a low level tray which can also be installed virtually level with the floor. Consequently, if you have a problem with steps this could be the ideal option for you. 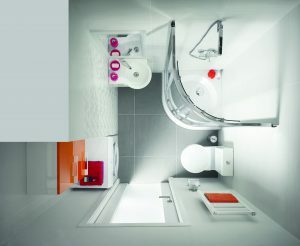 Our popular 'bath out shower in' option offers a cost effective way to make your bathroom more accessible. Your bath is removed and a bath size tray is installed in its place. We have three walk-in shower options on display in our showroom in West Malling, Kent. For more information or to arrange for a surveyor visit, please call us free on 0800 566 8889 or use our contact page. We install throughout Kent and most of the South East. On behalf of my parents I would like to thank your first class company for removing the bath and installing the walk-in shower at their home in Coxheath. From the very first phone call enquiring about your service, to the completion of the installation we can't praise you enough. When Mark first visited he advised on the best approach and this has turned out to be perfect! We were kept up to date with phone calls whilst waiting for the work to commence and the installation actually commenced during the week that we had been promised. Tony the fitter did such a good job that the bathroom doesn't look as if it has been disturbed at all and everyone who has seen it has commented on what a good job has been done, even members of the Palliative Care Nursing Team who visit Mum at home. An added bonus was that extra care was taken to protect carpets, etc. and when Tony and the electrician had finished you would never know that such a major job has been done in the house. We would have no hesitation at all in recommending your service to anyone who needed this kind of work carried out.